In my first entry on how transit centers fit into the urban form and how they can they can fit better into a strong vibrant urban form I showed a worse case example with the freeway based Parkrose-Sumner Transit Center near the Portland International Airport on the MAX Red Line. 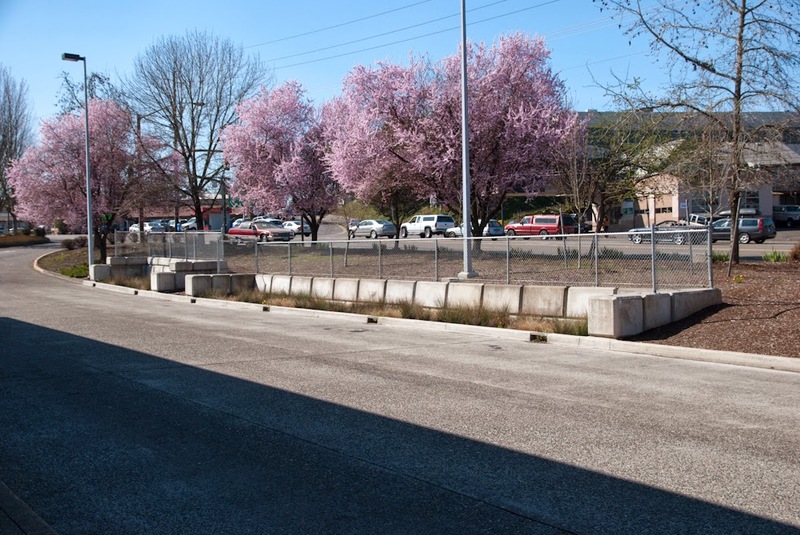 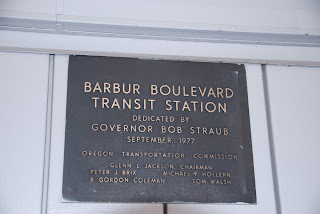 Today's entry is an even worse example and that is the Barbur Transit Center which is stuck between Interstate 5 and its predecessor Barbur Blvd which was once US Highway 99W. 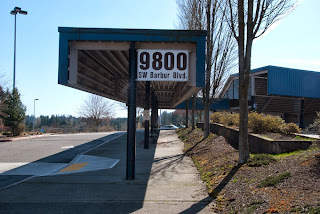 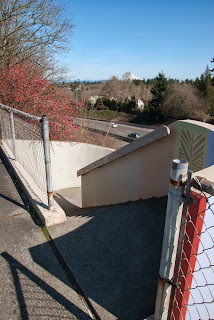 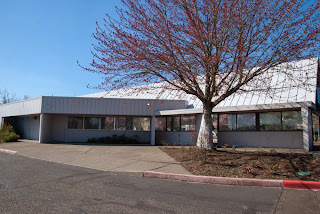 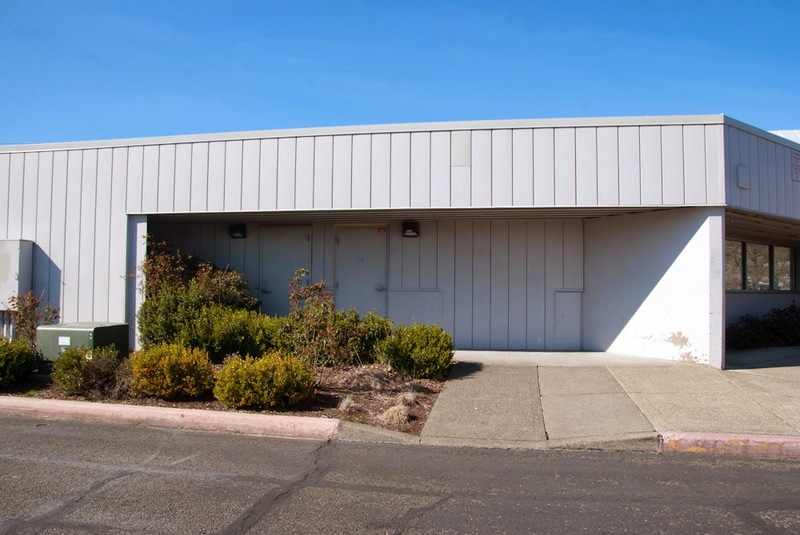 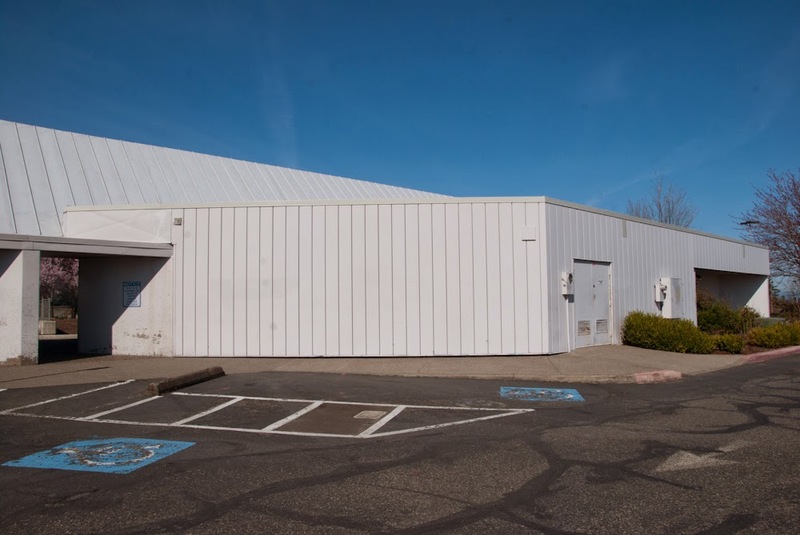 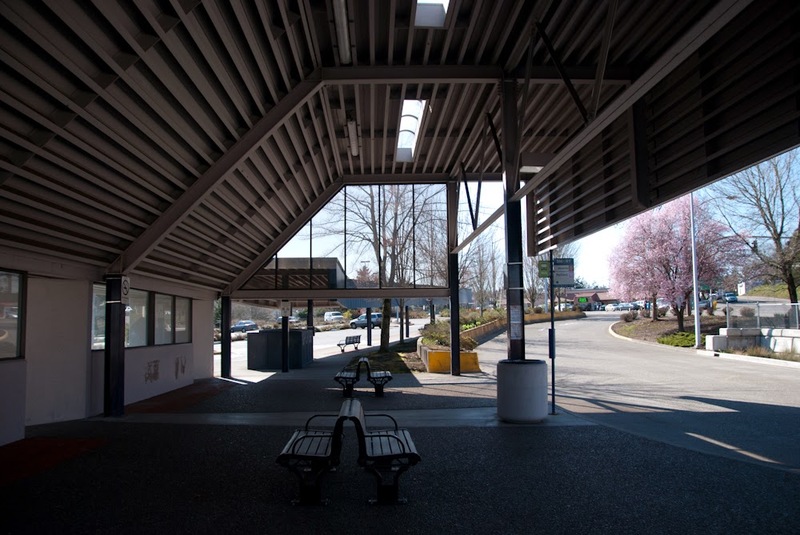 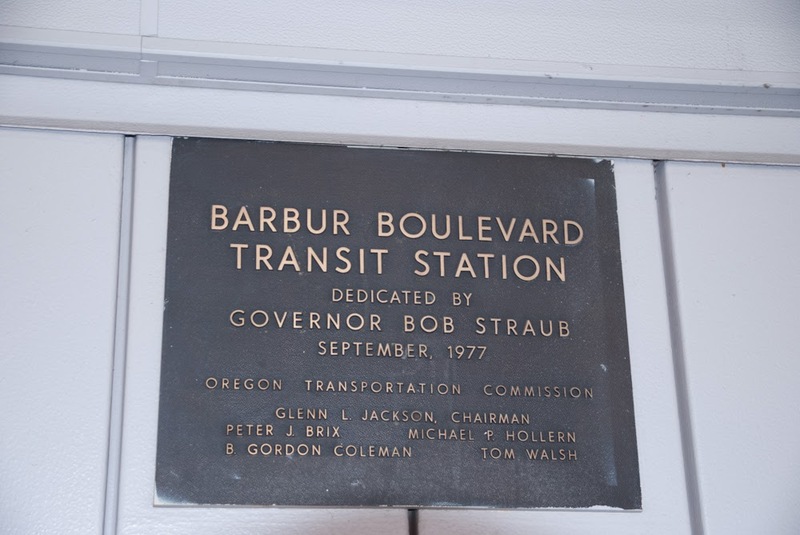 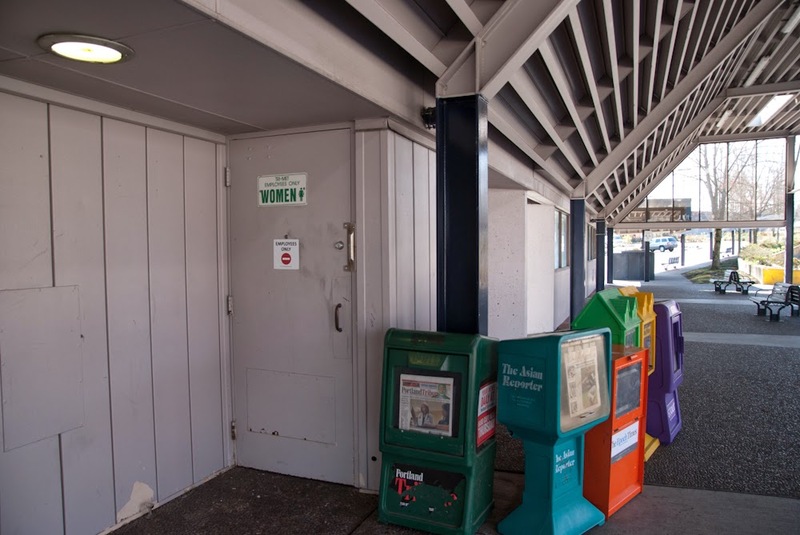 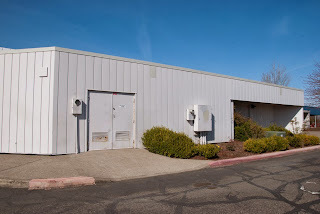 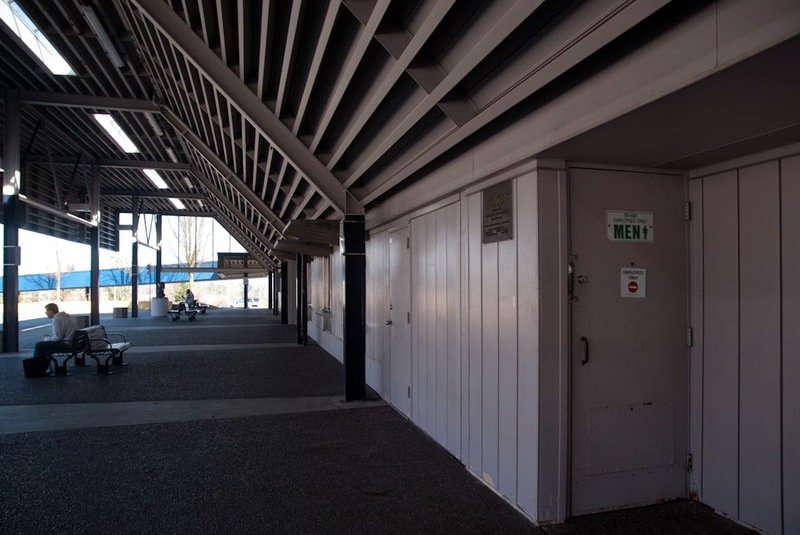 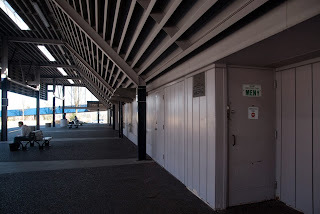 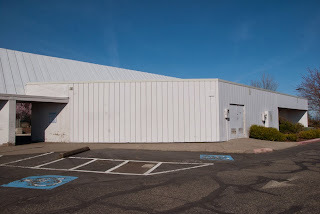 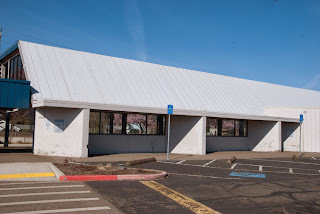 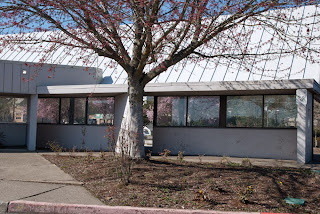 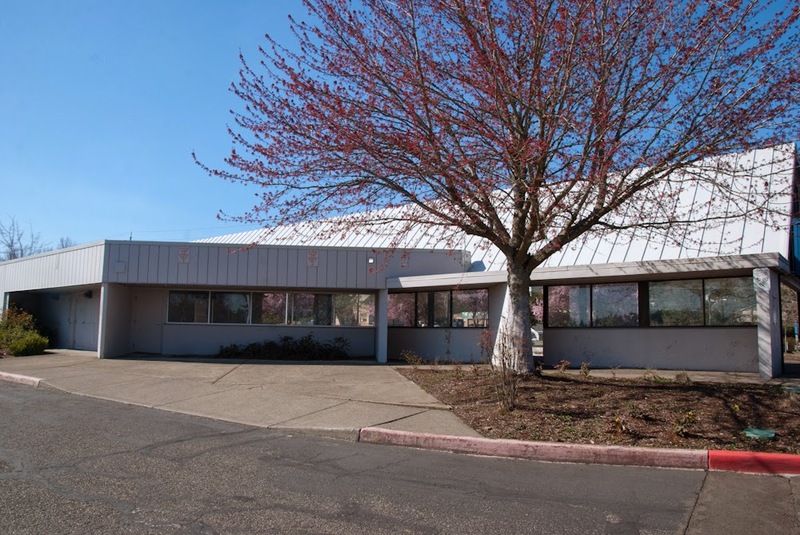 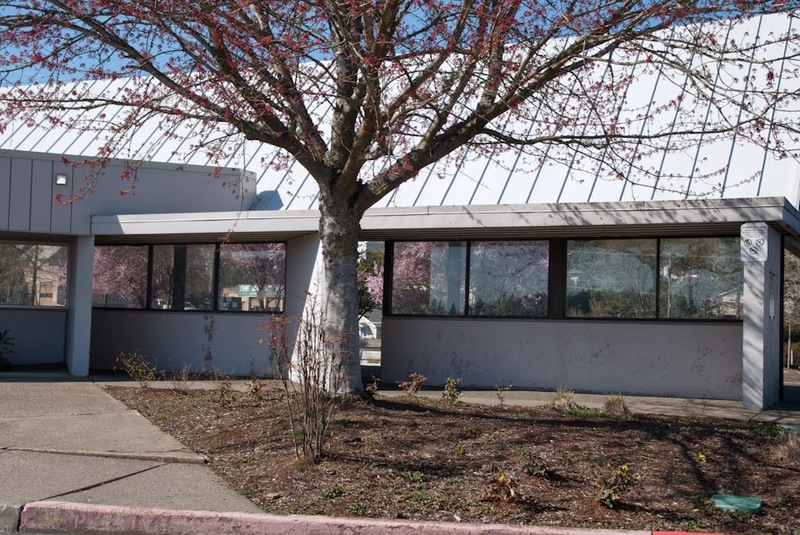 The Barbur Transit Center is currently the oldest transit center in the Trimet system having opened in 1977 and as you will see it is showing its age. 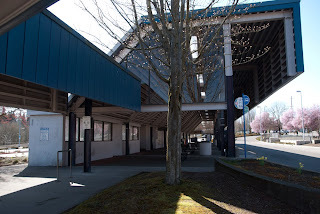 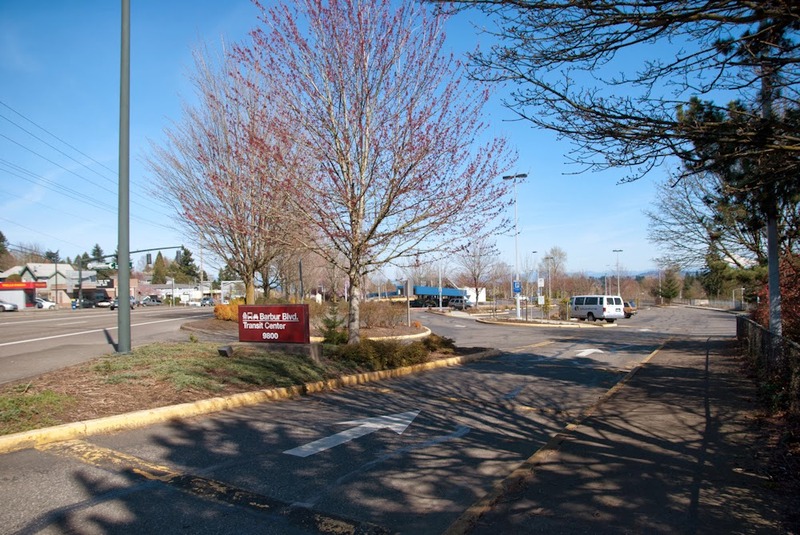 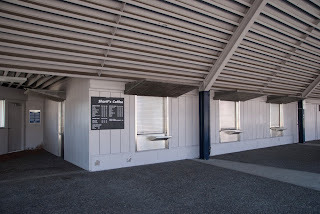 The transit center is actually nothing but a glorified Park N' Ride lot as the area around the transit center is very auto oriented and hostile to pedestrians and is not designed to blend into the community or the community to blend into the transit center. 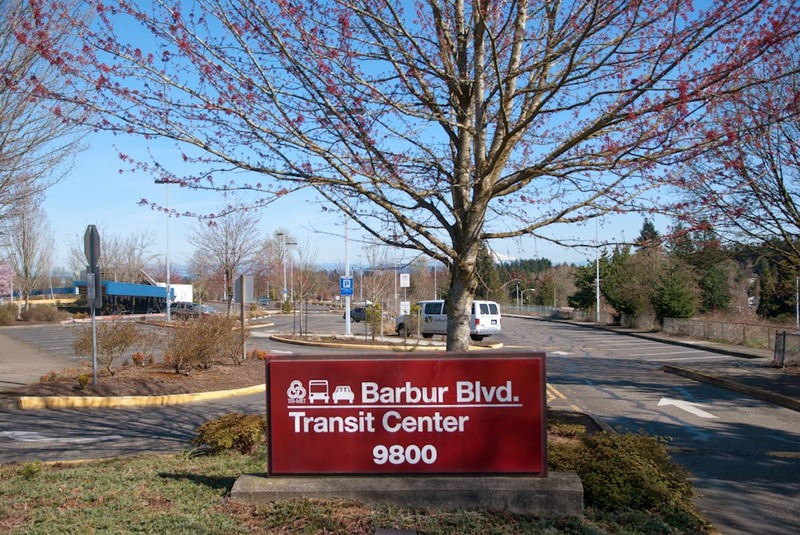 Zoning around the Barbur Transit Center. 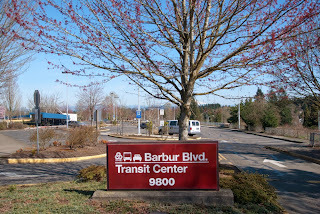 Note the dot does not represent the transit center itself which is actually to the left of the dot where the loop road is which is the bus area. 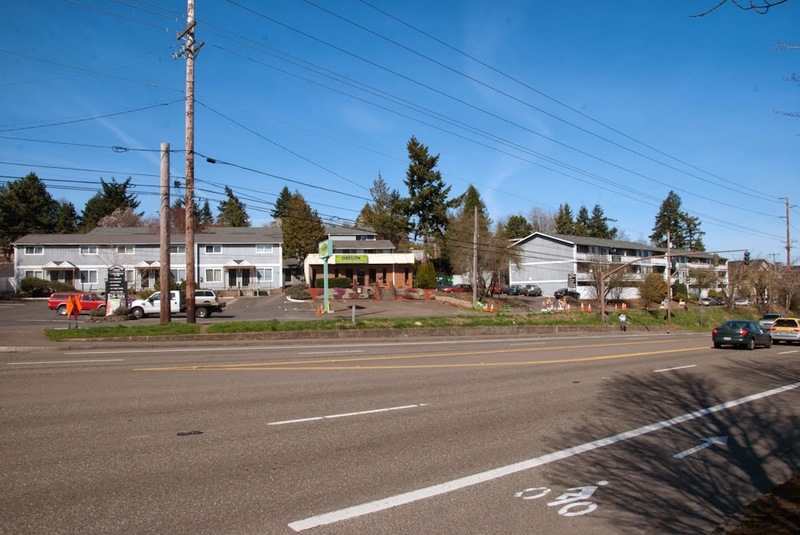 The CG stands is general commercial status while the CO2 means low density commercial/office uses that are auto oriented. 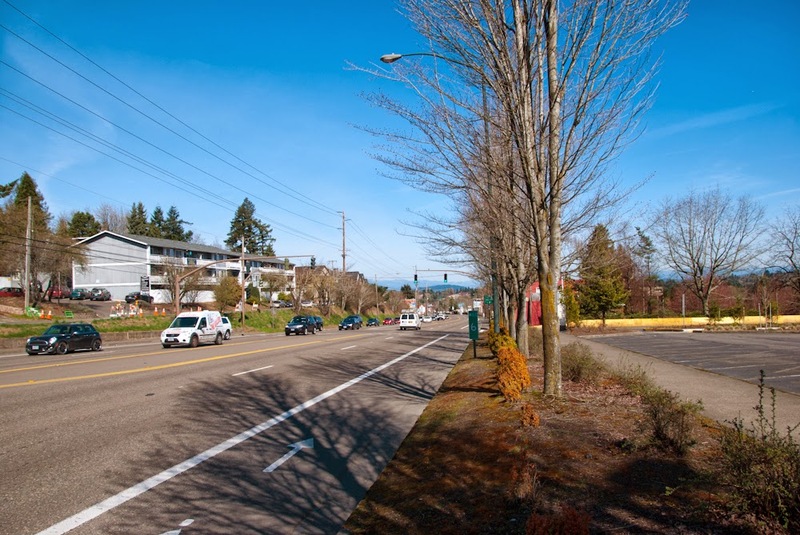 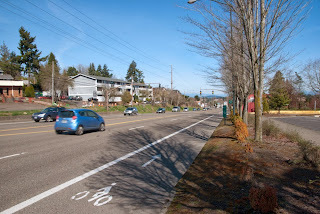 Barbur Blvd is a general busy road and because it is a state highway there is only limited things that can be done to change how poorly designed the street is for alternative transportation. 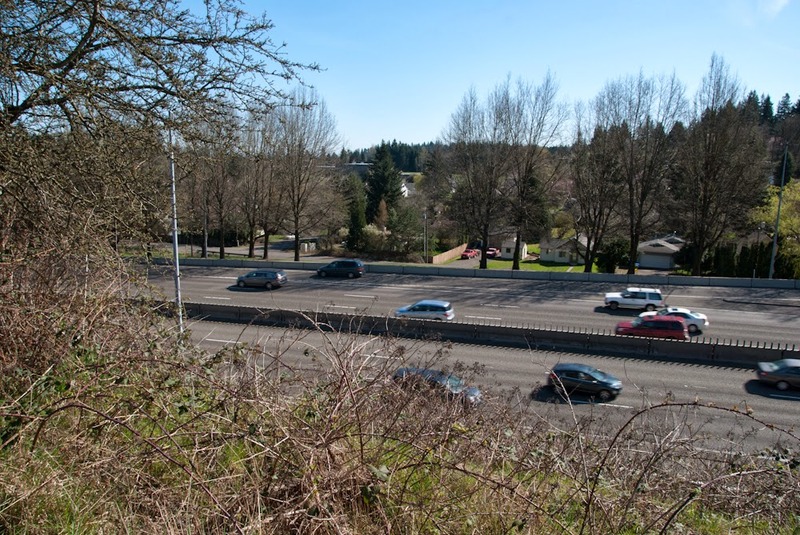 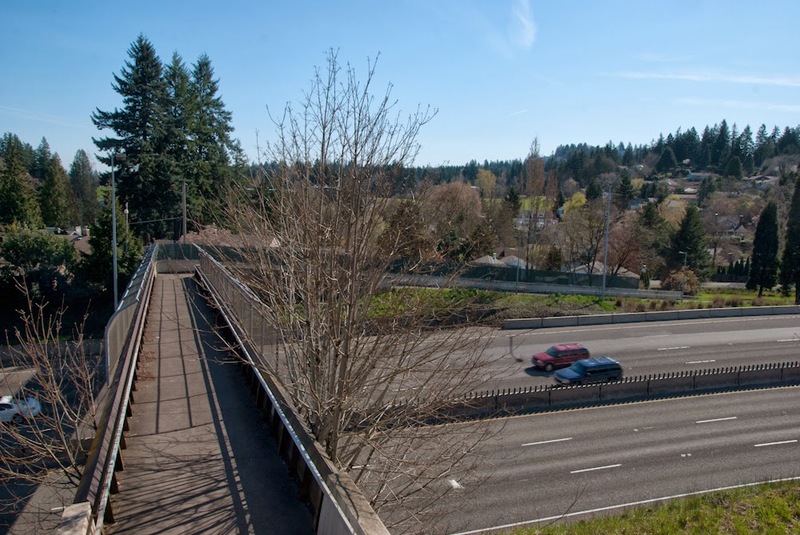 In fact, recently the Oregon Truckers Association was able to push through legislation in the state government that makes it nearly impossible to make state highways friendlier to pedestrians and transit or to reduce lanes for transit related projects. 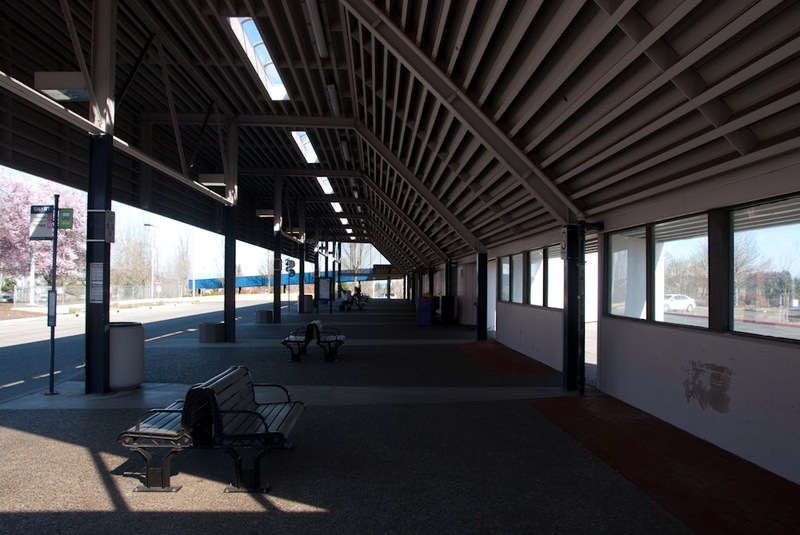 The transit center is part of the Southwest Corridor project which the city, Metro, and other agencies have been working on for the last few years. The two primary proposals are to have either a light rail line or enhanced bus service. 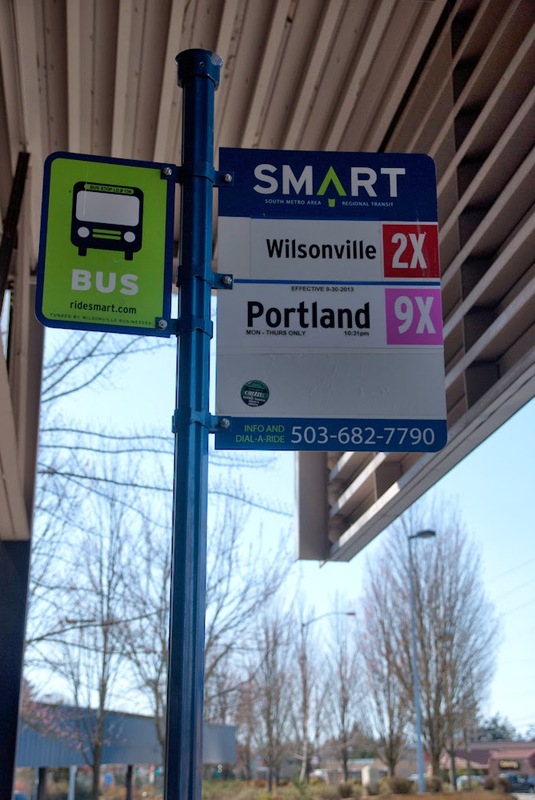 For its part the city of Portland has been working on new zoning for the area that would increase the density and make it more transit friendly but how soon it will happen is anyone's guess. Two views looking northeast along Barbur Blvd. 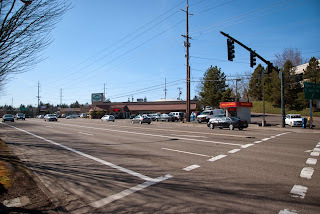 The light ahead is for cars pulling out of the parking lot while buses pull out directly behind me with no traffic light assistance. 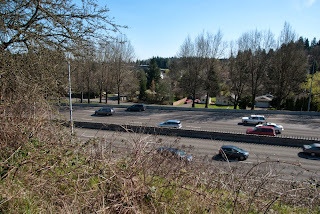 As seen from the above photos, at this point Barbur Blvd is a high speed highway with a speed limit of 40 mph. The photos were taken on a Sunday so traffic is lighter than normal. 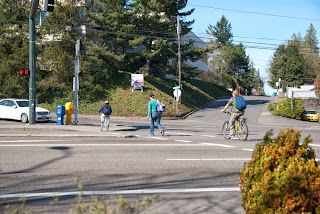 As can be seen this is not for the faint of heart if your a pedestrian. 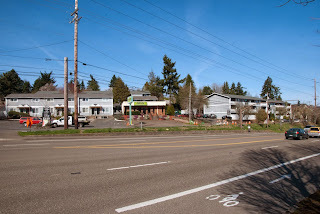 While the area is mostly low density there is a scattering of apartment buildings as can be seen across the highway from the transit center. 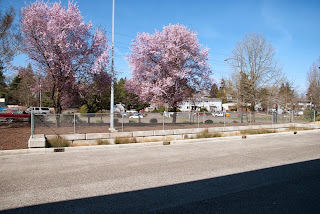 Three photos looking across Barbur Blvd from the transit center. 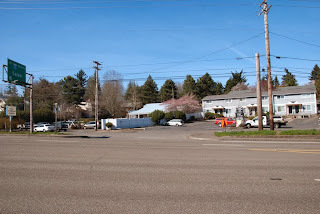 Once again you can see a few apartments and an office complex but the area is dominated by auto oriented uses. From these pictures you can clearly see why the Barbur Transit Center is nothing but a Park N' Ride lot currently. 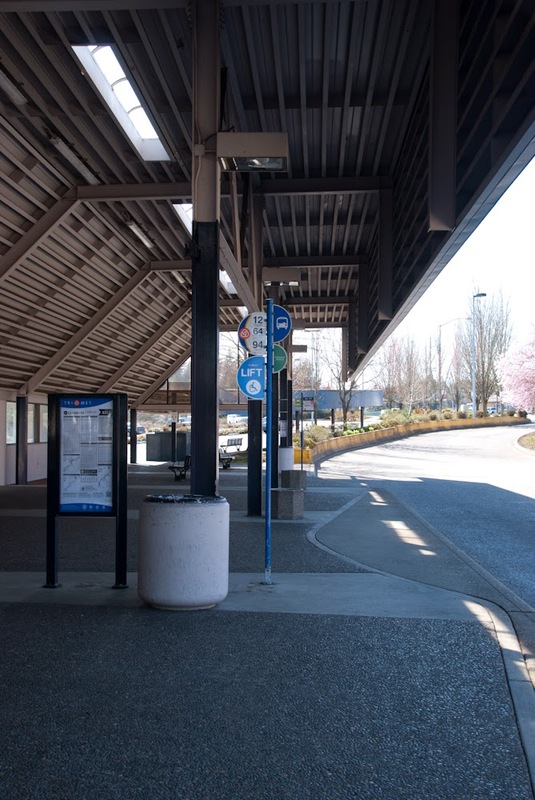 The area across the highway is poorly connected to the transit center which seems to sit on a island between two unfriendly super speedways. 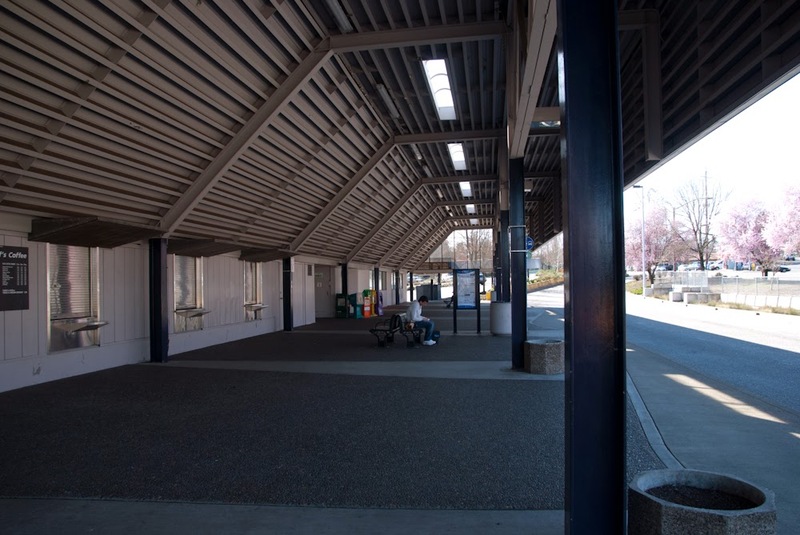 As I said the transit center itself is looking like it needs a major face-lift as it is a depressing place to wait for a bus. 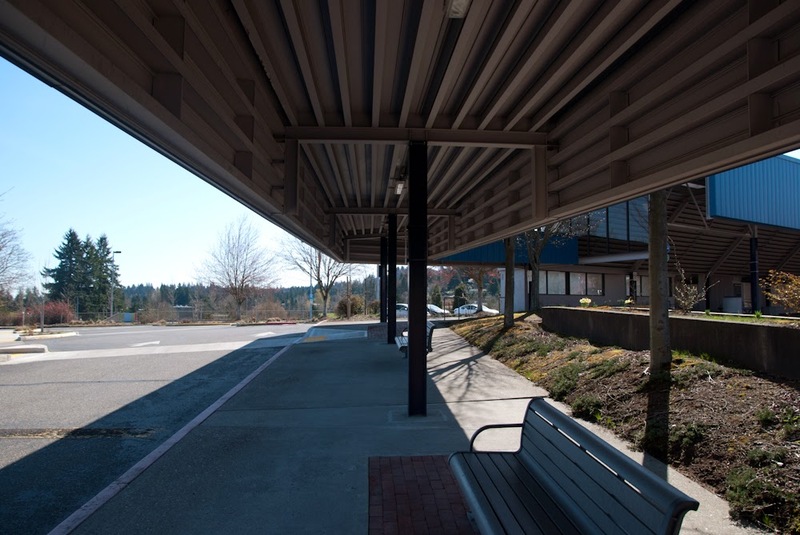 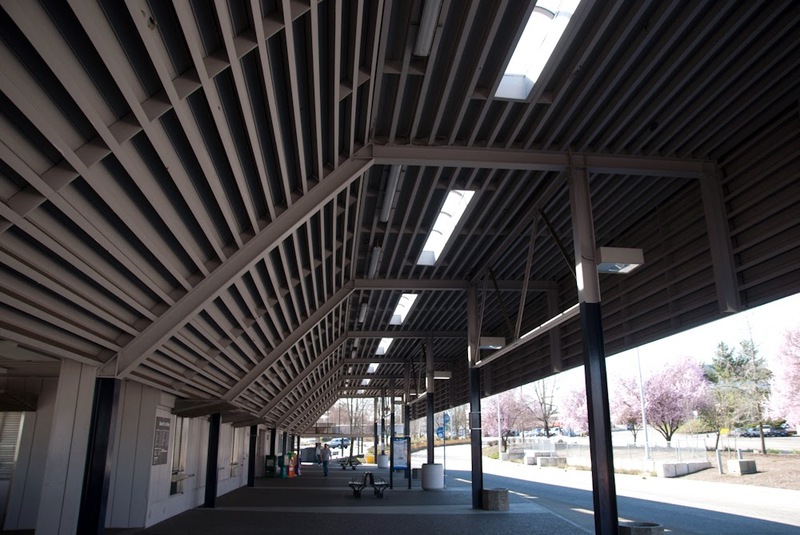 While there is skylights above the area where you wait for buses, they do little good because except during the summer the sunlight does not hit the skylights which actually should be in the slanted side of the ceilings although this could possible cause vision problems for the bus drivers when they were driving through the center. The center was home to a Sharif's Coffee but apparently only for a short time but I am guessing that because the center is only really busy during rush hours there was not enough business to justify its existence. 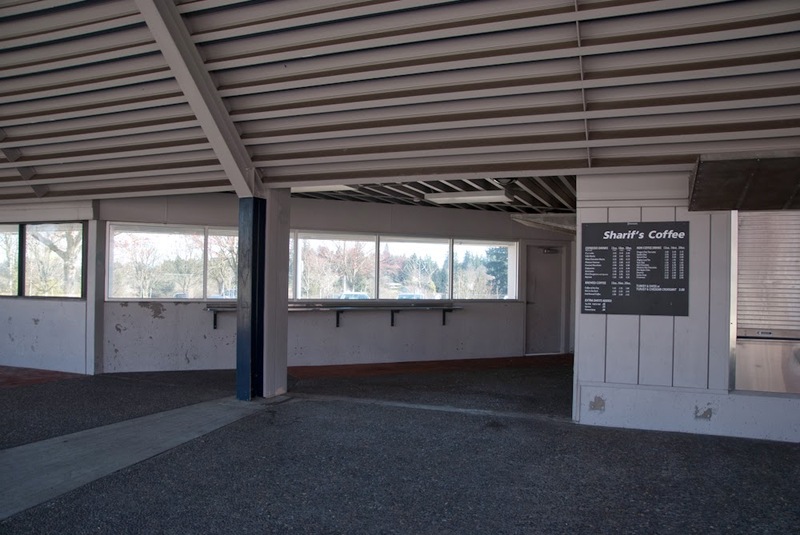 Now if the transit center was more integrated into the fabric of the community there is a change that this coffee stand would have a better chance to survive but as it is only people actually catching a bus would actually use it. 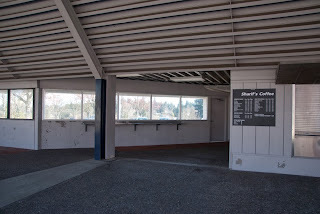 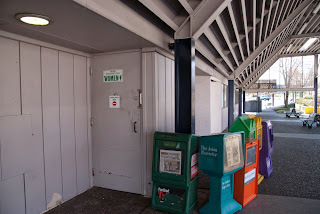 I am guessing that the concession area itself was once a Trimet ticket office in the pre-internet days although I am not sure about that. 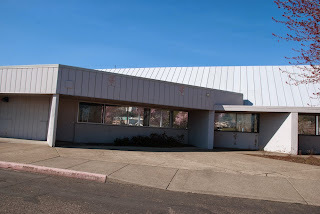 There has been some changes to the center over the years. 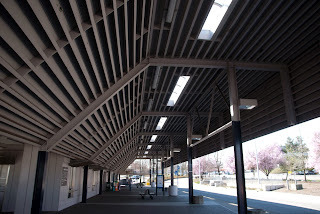 As can be seen in the photos above there use to be bus bays for the buses to pull in but they have been replaced by a straight curve which probably makes more sense for a center that buses mainly operate through and not layover at. 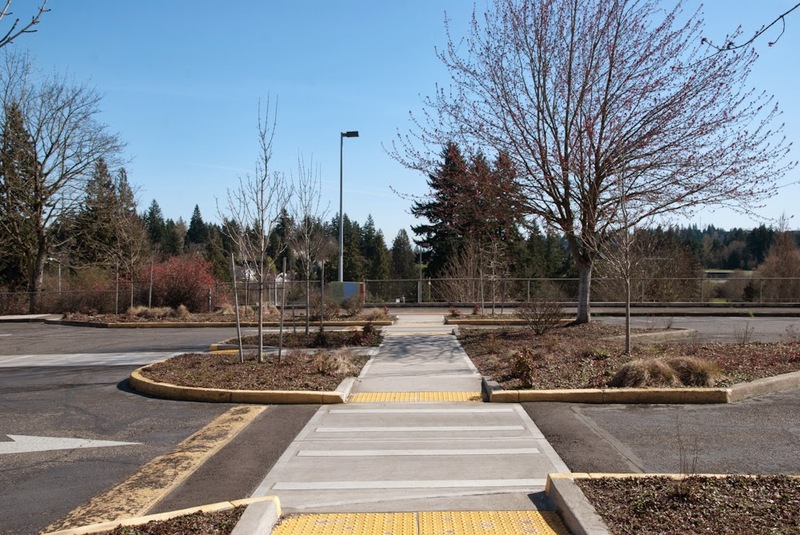 In the pictures below you can see the most recent changes to the transit center as new drainage bio-swell drainage systems were added to several areas of the transit center the largest being next to where the buses drive through. 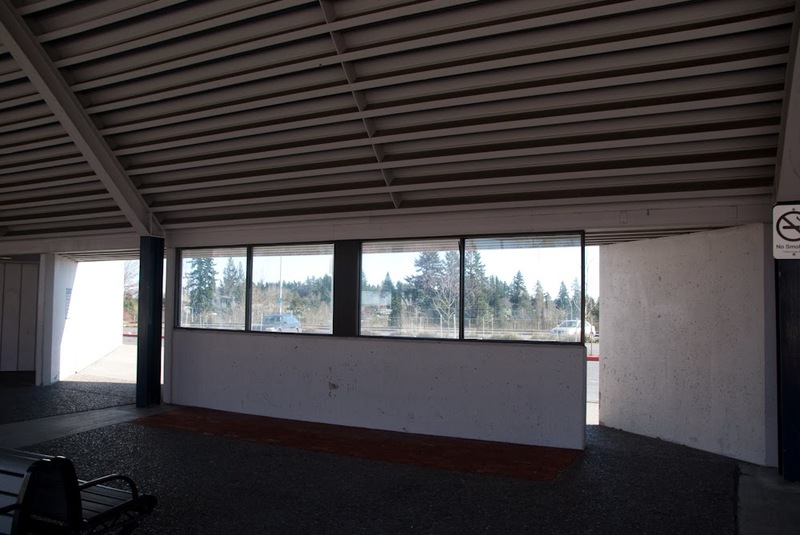 More views of the transit center showing that it does need a good facelift. 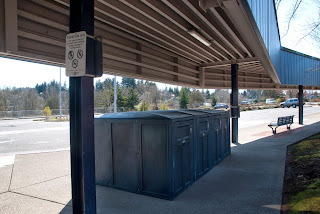 Bike Lockers and the pedestrian exit to Barbur and Taylors Ferry Road. 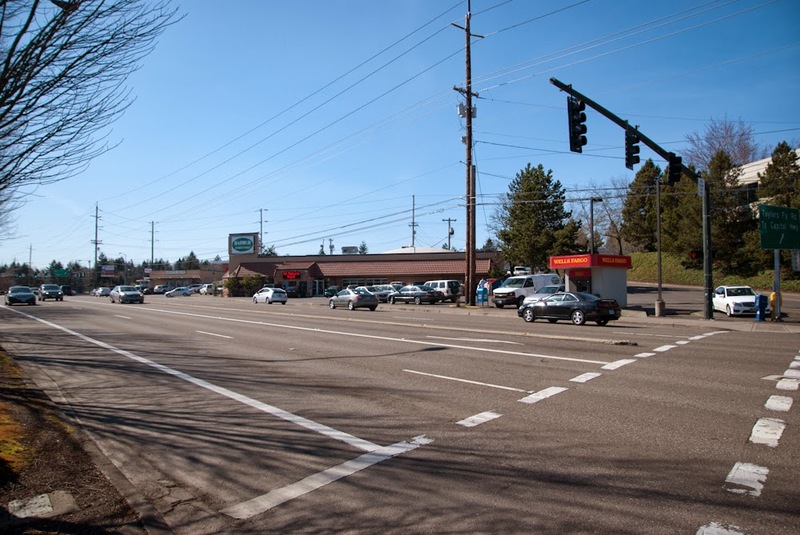 Most people who don't drive to the center arrive either by walking from Taylors Ferry Road or down Barbur Blvd from Capitol Highway. From the above photos you can see that crossing Barbur is not a fun experience especially for the elderly and those with disabilities. 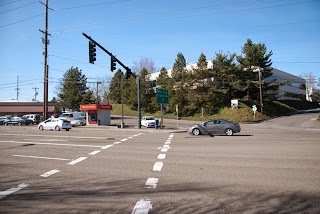 Route 43 turns makes a tight hairpin turn off of Taylors Ferry Road onto Barbur instead of serving the transit center although it did at one time. 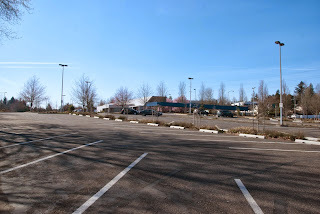 There is one nice feature of the transit center and that is the availability of a pedestrian bridge to cross Interstate 5 so that people do not have to walk to Capitol Highway then to Huber street to reach the neighborhood directly across the freeway from the transit center although like any pedestrian crossing of a freeway it is not the nicest experience. 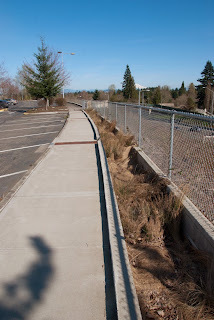 In addition the neighborhood across the freeway is one of the most pedestrian unfriendly in Portland although some sidewalks are finally being added to this area. 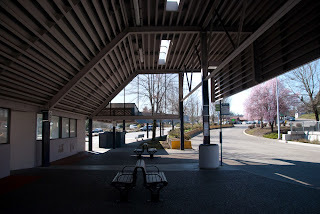 From the views above you can see that the transit center is not much to look at from the parking lot and looks very typical of 1960-1970's architecture. 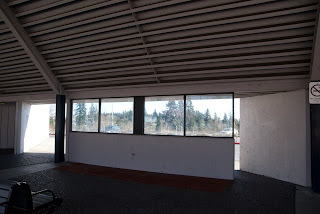 While the windows might be nice as I mentioned above some skylights in the slanted part of the roof would go to a long way to making the center seem less dismal if it would not interfere with bus drivers visions. 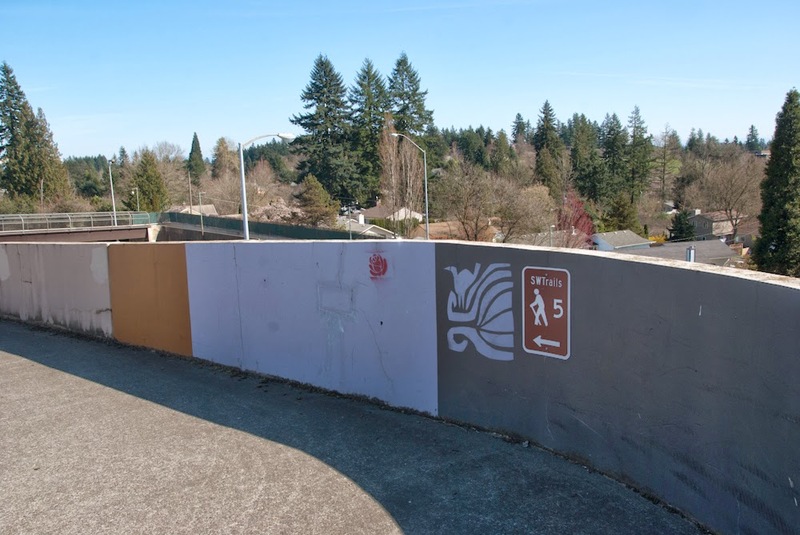 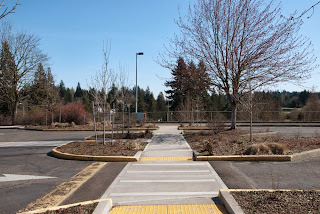 As can be seen in the pictures below there has been some pedestrian oriented improvements to make walking from the pedestrian bridge a little nicer than walking through the standard parking lot. 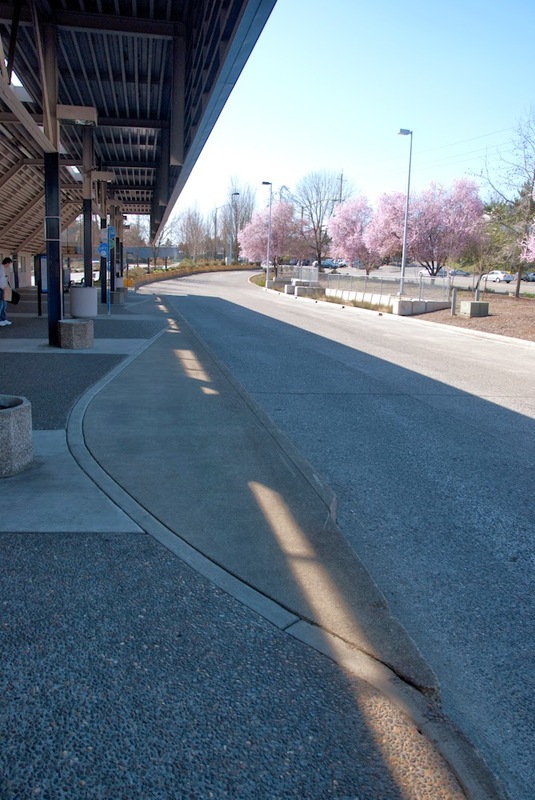 More of the new drainage treatment for the transit center. One thing that can be said is that they did try to mitigate how bad the huge chunk of parking lot can be by putting in a new natural drainage system. 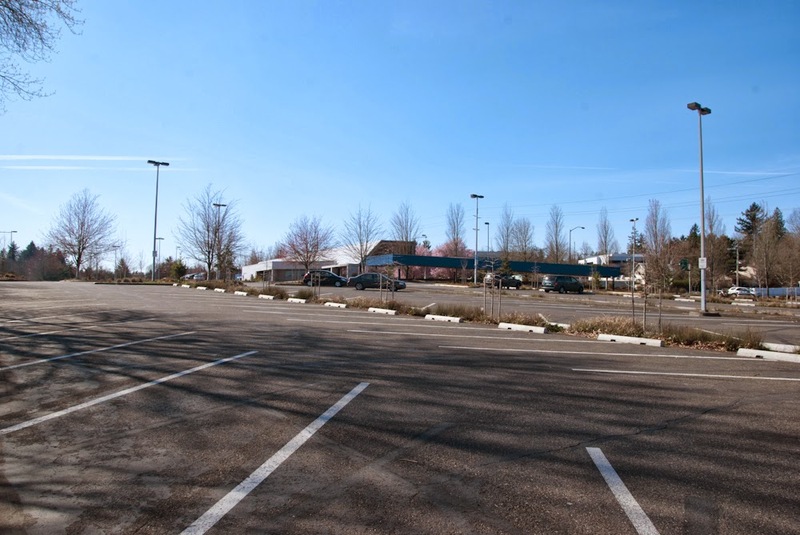 Whether that counters that this is largely a huge Park N Ride lot that does little to create a vibrant community I highly doubt it. 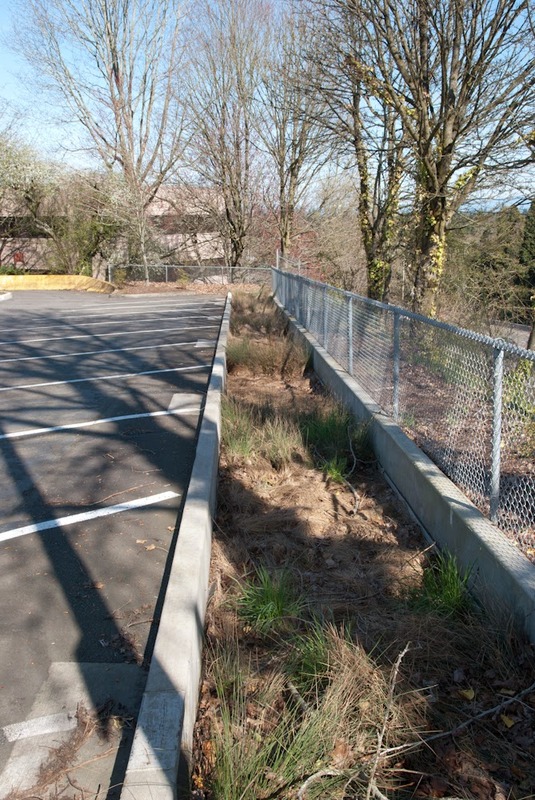 From the view below you can see how much land is actually taken up with parking at this transit center. 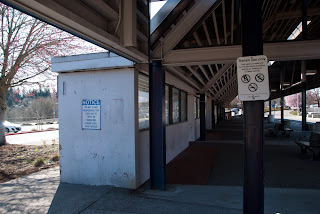 Not that the parking lot extends to the far side of the transit station and is usually full during the week. 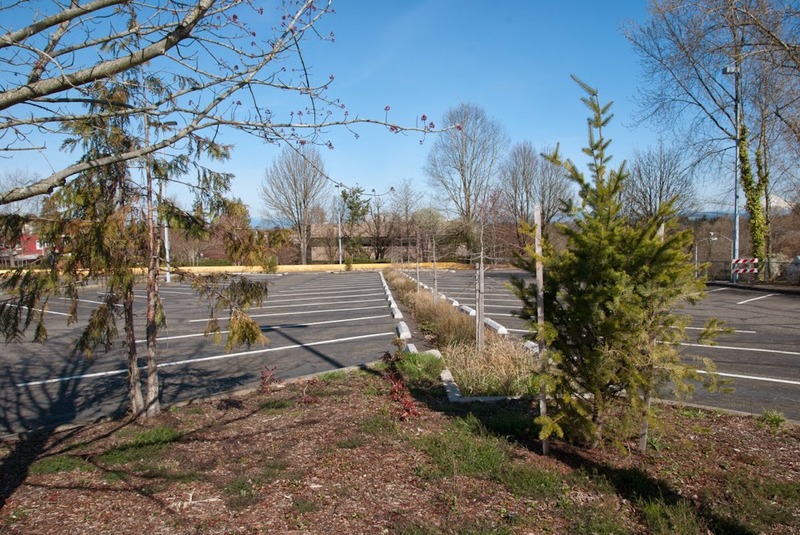 Is this any better than a big box parking lot? The question is, what can be done with this area? 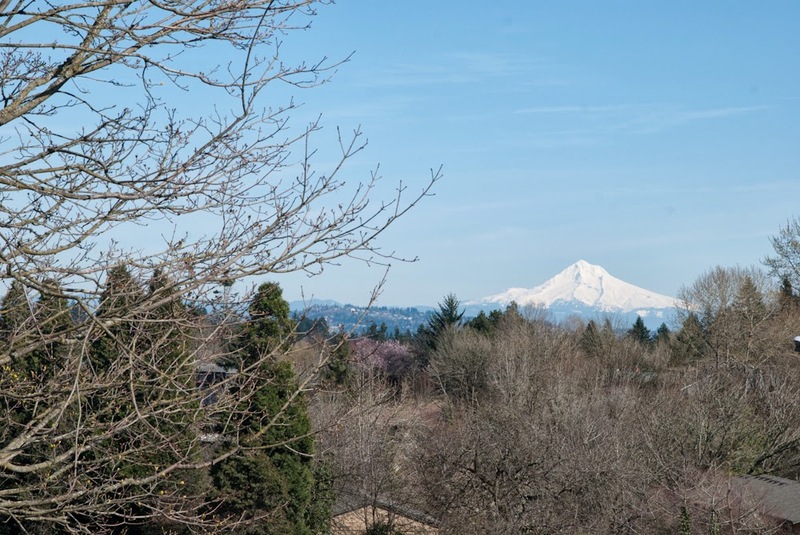 The first thing that needs to be done is the zoning changed to allow more transit oriented development in the area which the city of Portland is working on. As mentioned above any changes to the highway is going to be difficult unless the city takes over maintenance of the road from the state which the city cannot afford at this time. 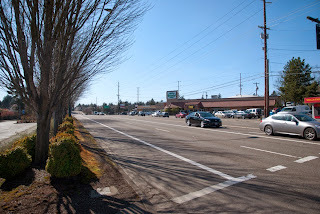 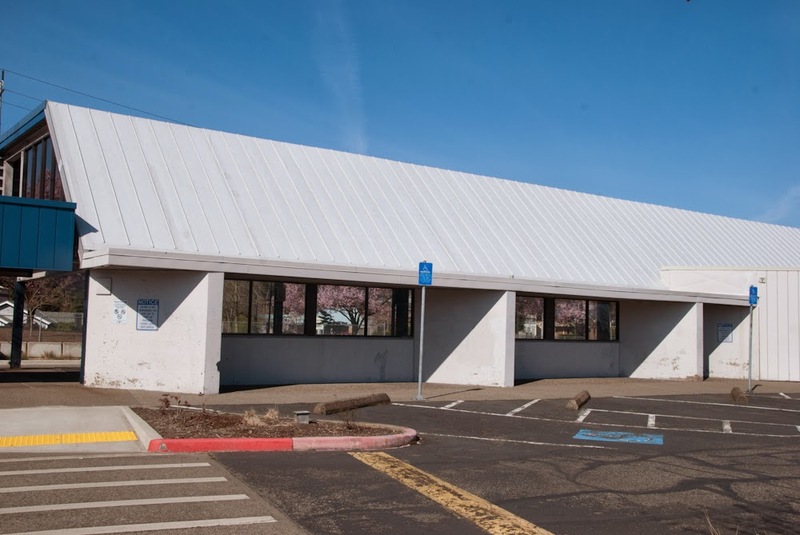 The most recent change in the area has been the addition of a Walgreen's at the corner of Barbur and Capitol Highway one block away which has created more traffic problems in an already congested area along with an increase in crime. 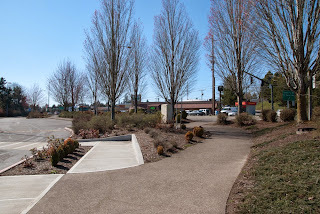 Like most Walgreen's it is very auto oriented with very poor pedestrian access. Ultimately what happens to the area will depend on the Southwest Corridor project and how effectively the city is able to up-zone the land. Right now the transit center is nothing but a glorified Park N Ride lot that does nothing for the community itself. 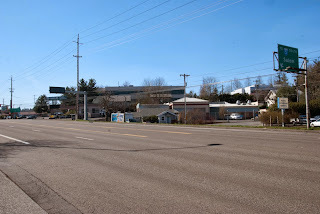 This is the urban form at its worse, but sadly fits into the present form of the area. 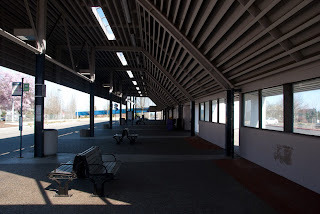 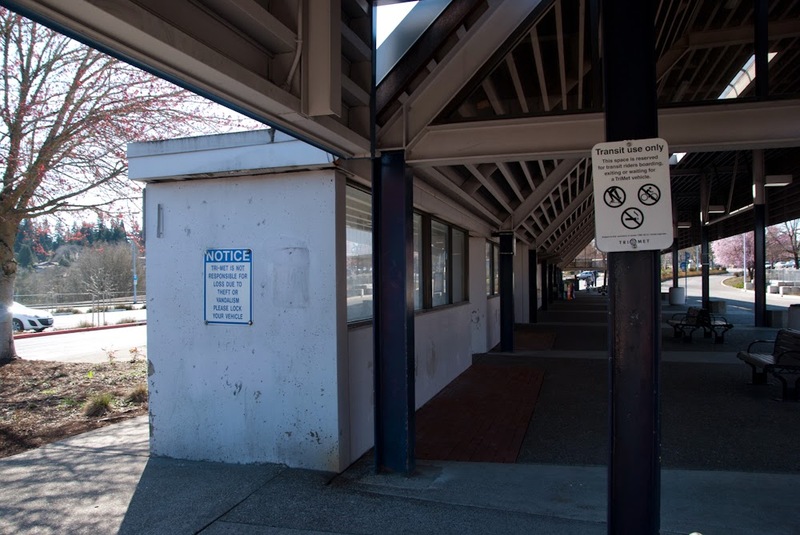 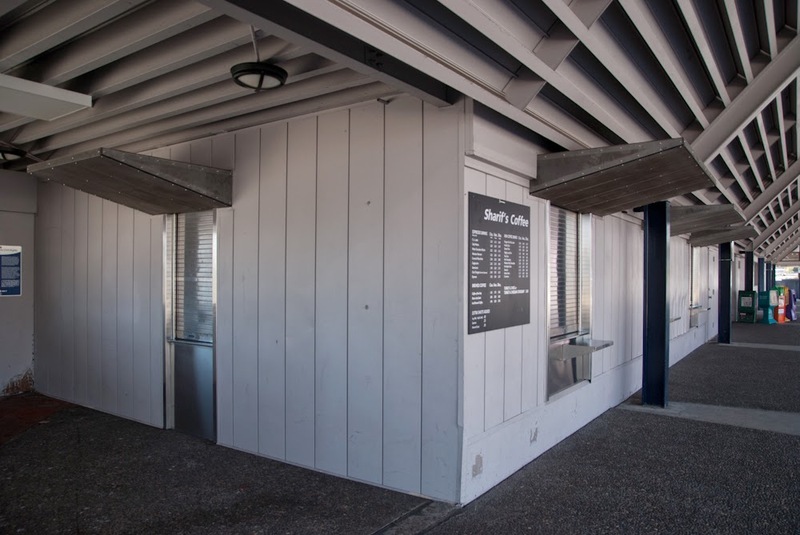 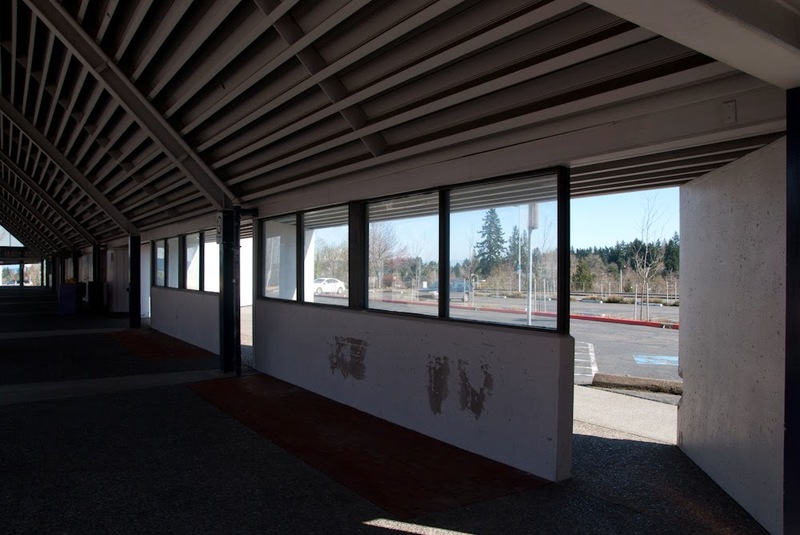 As I mentioned the transit center itself is showing its age and needs a major face-lift. 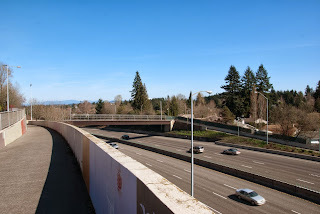 However, that will probably not happen until it is decided exactly what form the Southwest Corridor project will take. The area has lots of potential but it will take a joint effort to make this area transform from its present highway orientation to place that is welcoming to all.